Description of "POETRY FROM THE 27 CLUB"
BRIAN JONES,JIMMY HENDRIX,JANIS JOPLIN,JIM MORRISON,KURT COBAIN AND THE GREAT AND TALENTED AMY WINEHOUSE. RAY C BRADBURY WAS BORN IN THE CRICKET MAD COUNTY OF YORKSHIRE ENGLAND. HE IS A PROFOUND WRITER AND HAS PUBLISHED BOOKS ACROSS THE GLOBE. खुदा तुझको बना दूँ by एम. ए. 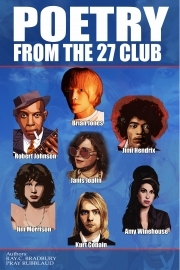 Reviews of "POETRY FROM THE 27 CLUB"